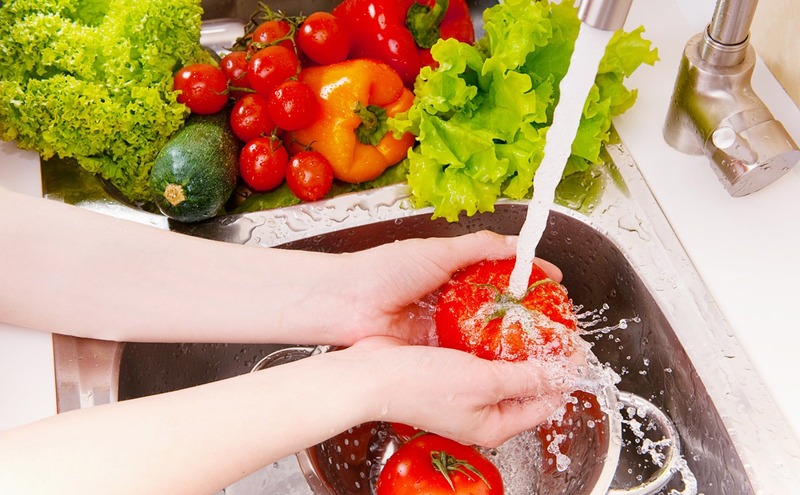 People rinse fruits, vegetables, fish, meat, poultry,also pans and pots, and almost anything we can think of in the sink. Moreover, we wash glasses, silver-wear and looots of dishes and we even rinse the pet’s dishes and toys. I have heard that people bath their babies in the sink sometimes. I have some news for you. By simply rinsing the kitchen sink until it looks clean, unfortunately won’t keep in germ free. If you want to protect your family members from bacteria, I recommend you to clean and sanitize ever so often, at least twice a week. Well, there are different types of sinks that require different types of cleaning solutions. But the main idea is to disinfect, due to the fact that this procedure works to deter germs and bacteria from taking roost. There are three simple options that will help you sanitize the kitchen sink. Commercial disinfectant can be found anywhere, and is fairly easy to use, you just need to follow the directions on the label. 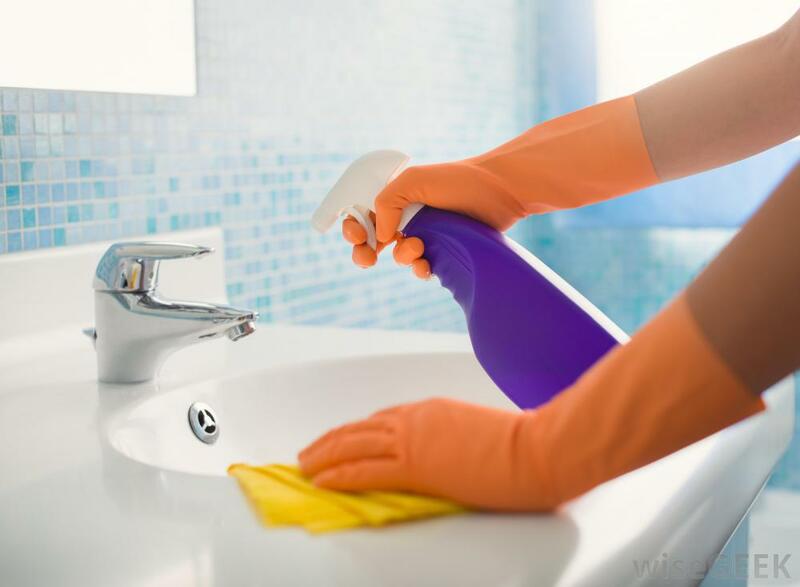 Commercial disinfectants are available in most home improvement stores, discount stores, supermarkets, and online. For ceramic and cast iron sinks. I recommend you to pay attention when using a solution that includes liquid chlorine bleach. Pour it slowly and be careful not to get any on surfaces that can be damaged. You should always rinse and clean any spots, not only to keep them unsoiled,but also, to prevent potential pitting. Keep in mind not to leave any fruits that contain acid, such as oranges and lemons, because this and salts can damage the finish of a stainless steel sink. The finish of these sinks tend to ruin when you use abrasive sponges and steel wool pads on stainless steel. Wetting the entire surface of the sink and liberally sprinkling baking soda onto the surface is the best way to deal with stubborn stains. 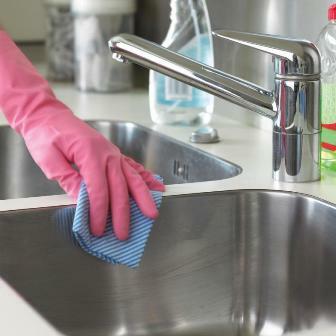 Use a nylon scrubbing sponge to work the baking soda in and then rinse thoroughly clean. In order to promote cleanliness these types of sinks should always be rinsed after each use. Running a dry cloth after it has been rinsed will also improve its longevity. To clean a cast iron sink thoroughly, wet the entire surface and liberally sprinkle baking soda onto the sink’s surface. These ones are the easiest to clean, whether you use a gel or creamy solution, this will help you avoid any scratches. You should keep in mind not to use any abrasive cleaners on ceramic sinks. Stains that may seem stubborn request a little more effort. If the stain persists, remove it using a clean cloth soaked in club soda.